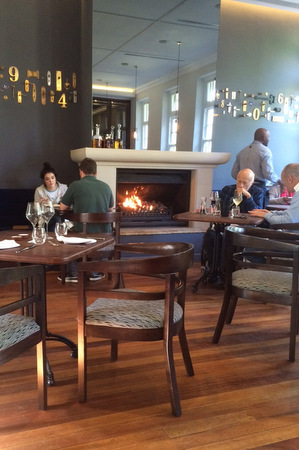 There’s a new place where people eat in rural Constantia. Open Door restaurant is modern enough so its central Art Deco bar doesn’t seem at odds near the chef’s table in view of open kitchen activity. But the remodelled River Café space is sufficiently time-worn with repurposed beams in ceiling alcoves, and old brass handles, numbers and hooks now forming decorative detail on smoky-grey walls. Most were building originals. Staff wearing dapper uniforms offered a café menu, or – what we tried – lunch and dinner options. Sommelier co-owner Neil Grant’s wine bottles zigzagged inside a glass display fitting 1000 labels. We ordered easy-drinking Fist of Fancy Pinot Noir (R160). If you have one dish from executive chef Annemarie Steenkamp, make it the nifty vegetarian starter. 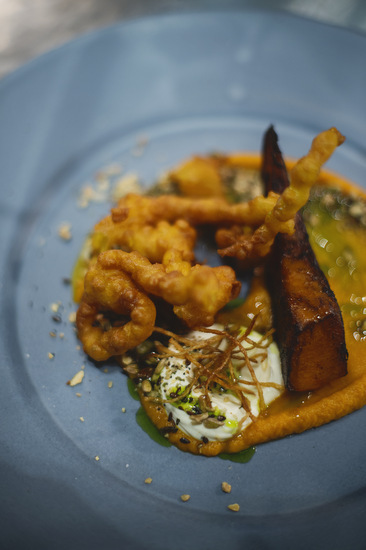 Soft pumpkin puree under spiced seeds, a buttermilk labne blob; zestiness from crisp-fried root ginger; herb oil. The fun came in dipping curried fritter squiggles into it all. 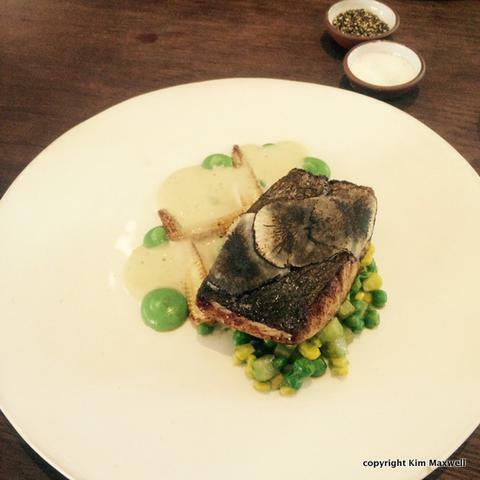 Vegetables also featured creatively in pan-roasted kabeljou, its crisp skin topped with charred turnip slivers, on peas and sweetcorn kernels. A leeky, light velouté tasted of poached oyster salinity. A fireside table showed off stately trees through a former schoolroom’s sash windows. Wintry moodiness in a chunk of venison loin; orange sweet potato kept interest; cranberry jus and puy lentils affirming earthiness. By the time desserts were sent, we were hooked. I’d probably skip on walnut and banana loaf again, although its banana sorbet and blowtorched banana balls were fun. But I loved the guava pudding. Freshness of aniseed panna cotta on a guava and fennel compote. 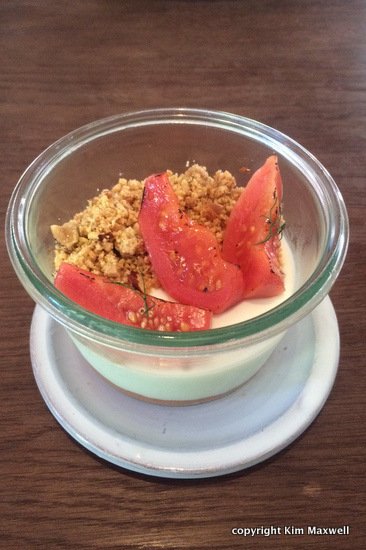 Simplicity, poached guava and homely almond crumbs on top. Steenkamp and Grant stamped buzzy Burrata and Bocca on Cape Town’s culinary map. Open Door’s experience is different. More polished, like many of its customers. But reliant on cleverly crafted combinations that wow if given a chance. What to eat There’s a lunchtime café menu (kale chicken Caesar to beef burgers). Or creative options on a small lunch or dinner a la carte menu. When to go Take in the space over a drink at the bar, followed by dinner. Or lunchtime is lovely near the fire. Who to take Enjoy with a romantic partner, impress your visiting in-laws or host a business lunch. What not to do Offer the management advice about how everything was before. It’s a new concept in an historic venue – relax into the experience. What to drink Wine – sommelier Neil Grant’s vast but approachable list has something for everyone, by bottle or glass. Whatever you do make sure you return later in the year, once their breakfasts on the deck are in operation. How much? A la carte starters R62 to R89; mains R98 to R172; desserts R42 to R62. The verdict A pricier yet quality food and wine experience.